I am wondering what your level of expertise is with the Dermaptera. I accidentally posted 2 images of this. One was ID'd as Labidura riparia, and one was frassed. Are you sure about this? Now it is the only one, and I can't see who previously determined one as L. riparia. 1. They're really big, especially compared to other species found in North America. 2. They have long antennae, with at leat 25 segments. I'm never 100-percent on counting antennal segments, but I can't get more than 12 out of this one. Forficulidae have a characteristic shape to the feet that's arguably visible here: the second of the three tarsal segments is sort of ballooned out and extending under the third/outermost segment. Look at the forceps on the female Forficula auricularia in the guide and on those of female Labidura riparia (the thumbnails above point to good examples). This specimen matches fairly well with the Forficula auricularia, but not very well with the Labidura riparia. The dermaptera in North America are such a small group that it's entirely possible for a motivated amateur with some knowledge of taxonomy (In my case from a couple of college botany classes) to develop a working mastery of the limited number of choices represented here. I've read every recent article I can find online, and gone through the keys in those that have them. By the way: please fill in the date. I could venture a guess based on the EXIF data, but that relies entirely on whether the camera clock was set correctly at the time the image was taken. I added the date. I had accidentally uploaded this image twice and one has been frassed. The other had been named by someone a L. riparia, but their name has disappeared. I found this image without a name, in my earwig image folder. However in my database, I found that it was named as a female L. riparia. Compared to my 7003499 image that also had this determination, I thought it looked so different that a mistake had been made in the database, so I put it on BG. Much to my surprise, it was then labeled as L. riparia female, like the one I already had, but which looked quite different to me. I normally put the determiner's name in an "identifier" field, but forgot to, so I don't know who had labeled it thus, or why. I hope they join in. As you pointed out about the antenna, even I can see that doesn't agree with Labidura. So that was clearly wrong. 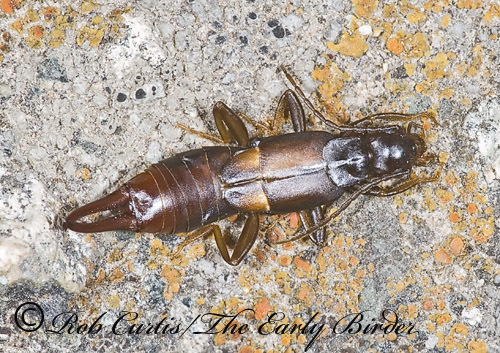 On the other hand, it didn't seem like the European Earwig either. It seems that the forceps are stouter and not as curved. I just don't know.